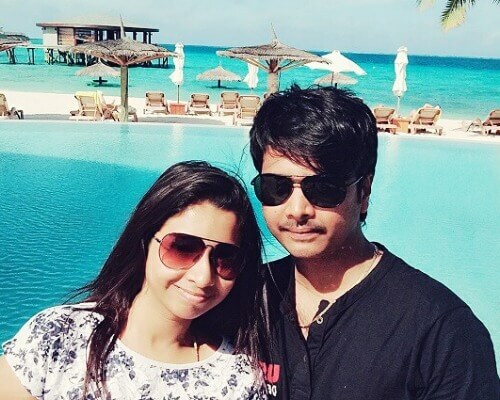 Nisarg’s honeymoon trip to Maldives was so good it appeared as if it was made in heaven. With the azure skies and waters complimenting their love story, the couple got everything they imagined and more. 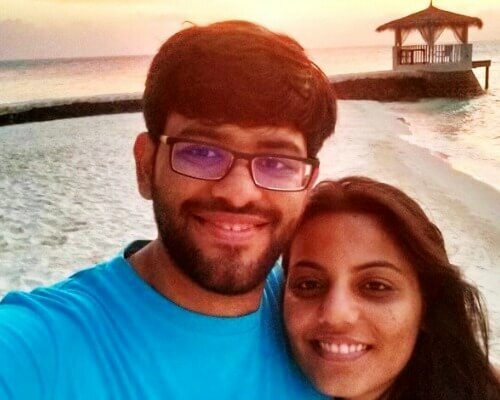 He booked their Maldives honeymoon tour package from TravelTriangle and it included their hotel, transfers, meals, and flights – all for a cost of INR 1,51,800. Let’s witness their marvelous journey! 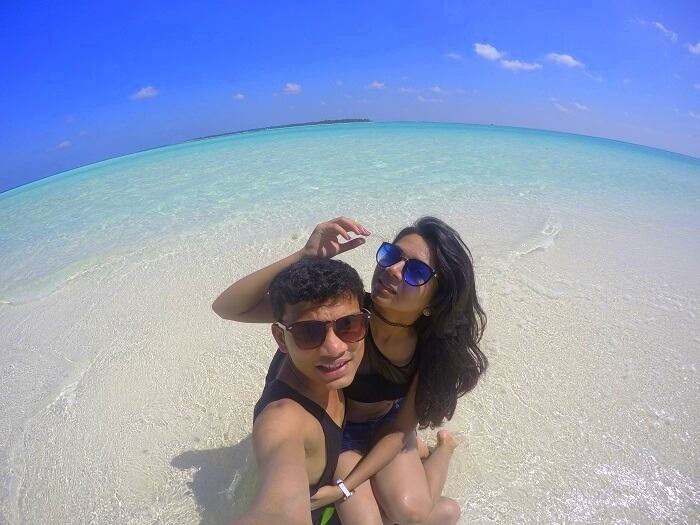 Our honeymoon in Maldives was a dream come true experience! It was my first foreign trip and a really special one too (for obvious reasons!) 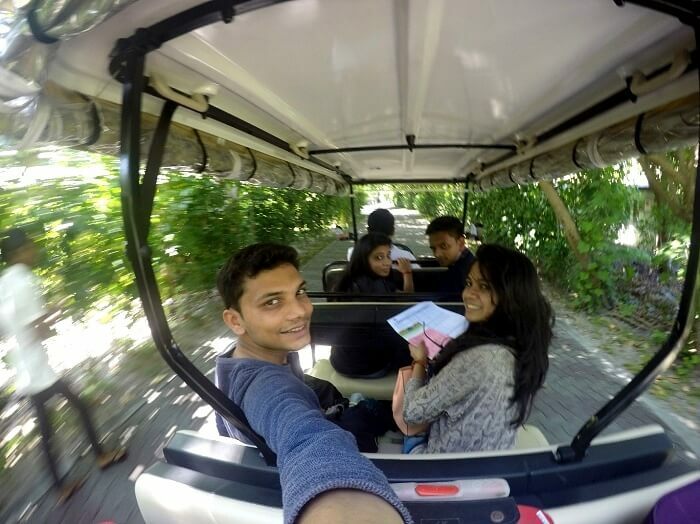 and it turned out to be more than perfect – all thanks to the beauty of Maldives and the activities it offered us. 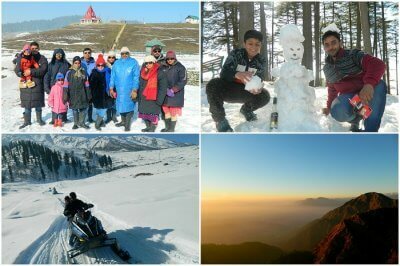 We had booked our package from TravelTriangle (found on the internet) and it was a breezy affair. The travel agents connected to us via TT understood our requirements and gave us the best possible quotes and itineraries as per our demands. 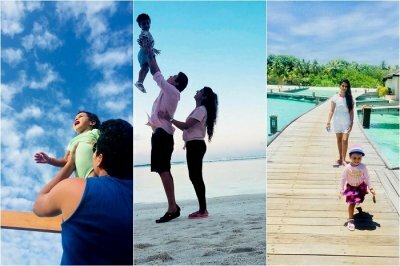 We were particularly excited about our beautiful island resort in Maldives – Sun Island Resort since we had heard a great deal about it and upon witnessing it, we surely knew why it was so famous. 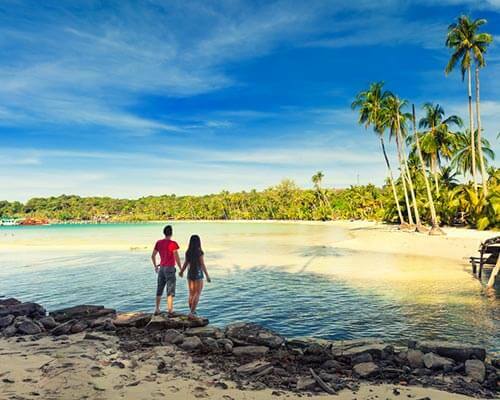 Tip: When it comes to planning a honeymoon, it is always better to do a research about the kind of resort you would want to stay at because some of them might not offer the kind of privacy you would are looking for. Thankfully, our agent guided us well regarding the same and Sun Island Resort turned out to be perfect. We reached Male around 9:30 am after a 6 hr journey with the Srilankan Airways. At the airport, we were greeted by a representative from our travel agent who guided us to a Maldives Domestic flight that would take us to the Maamigili Island from where our resort staff would come and pick us up. This resort staff then transferred us to the Sun Island Resort And Spa via a speedboat at 11:30 am. Our welcome at the resort was a grand one and we were allotted the room and served welcome drinks. The property was beautiful and our room was even better. 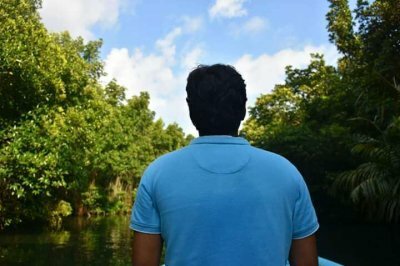 After resting for a while, we relaxed and soaked in the goodness of nature that the resort had on offer. It felt magical and blissful. 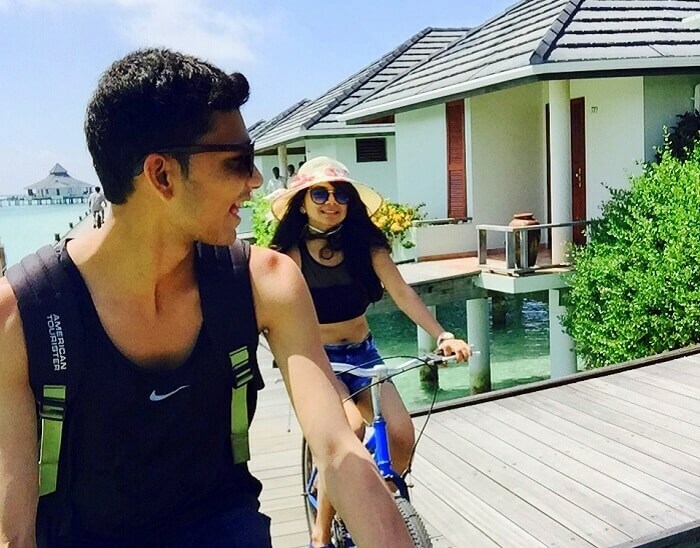 Maldives was love! 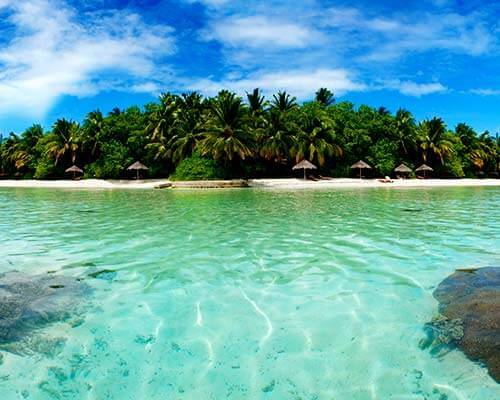 Tip: Maldives is one of those countries that offer Visa on arrival to Indians that is valid for 30 days. Thanks to this, we did not have to go through all the tedious formalities required to travel to other nations. 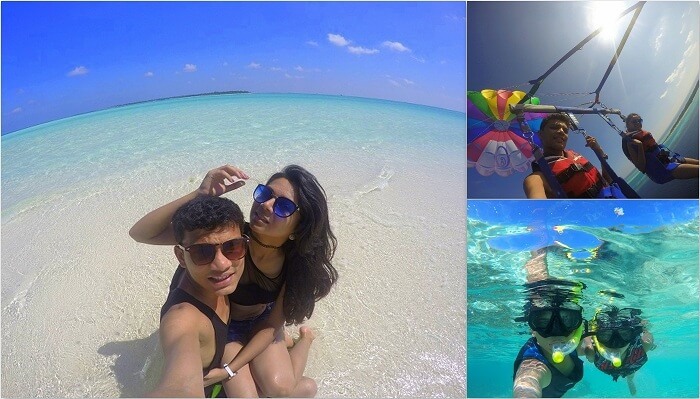 Day 2: A day full of adventure – sightseeing, snorkeling, and more! This morning, after a delicious breakfast, we booked a trip which included a BBQ lunch, visit to the local village, and snorkeling at the blue lagoon island (known for various kinds of fishes). 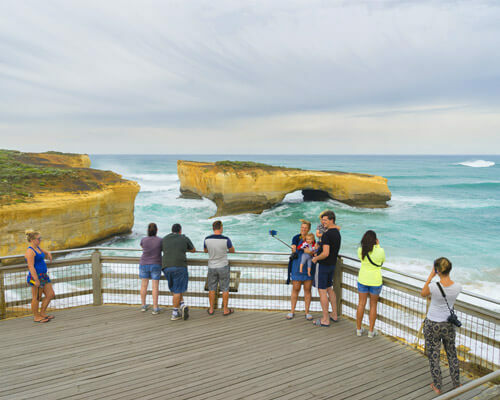 This trip cost us 75$ per person and was totally worth its price since we had a blast doing sightseeing and indulging in water activities here. 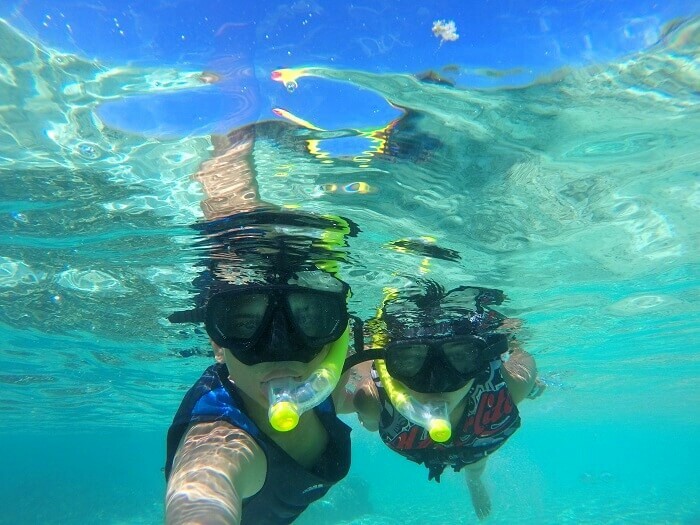 The underwater charm of the crystal clear waters will forever be etched on our minds. 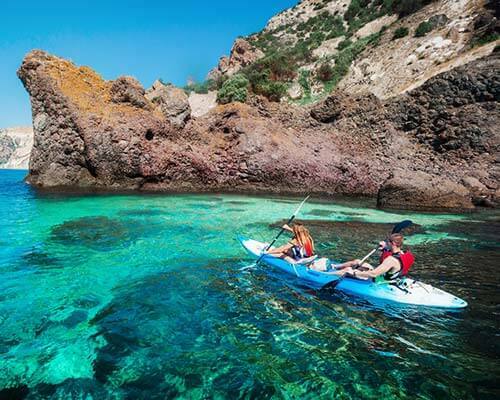 Tip: Always choose your resort based on the activities it offers if you want to enjoy the maximum – and yes most of these activities are paid, so do carry enough funds if you want to enjoy them all. After we were done with the breakfast, we rented a cycle (4.5$ per cycle) and roamed around our own, exploring everything on our way. 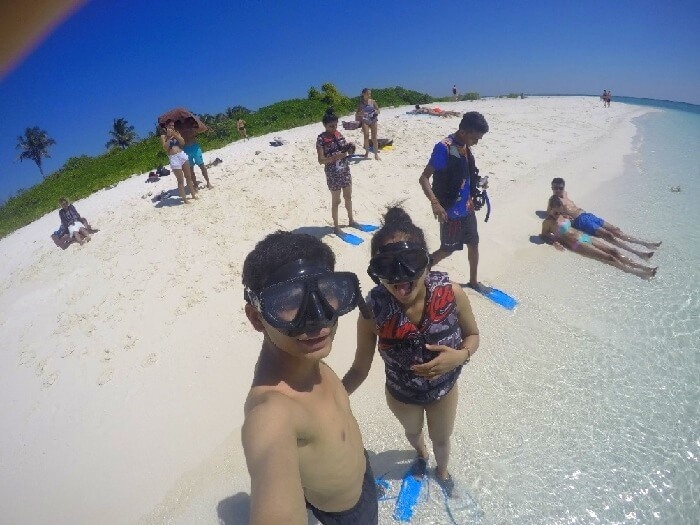 It was a lovely experience post which we went on to do parasailing (228$ for 2 persons). 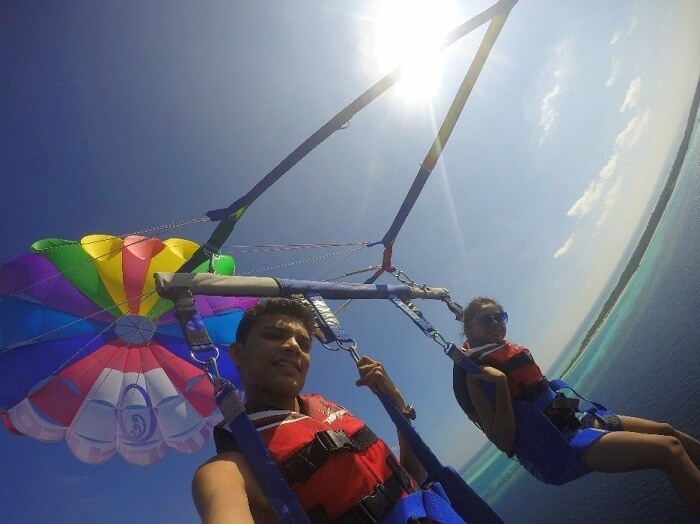 Parasailing was an out of the world adventure for us and we were thrilled by the beauty we saw from the above. The whole feeling of flying in the air was nothing short of magical and this was probably the best moment of our trip. Day 4: Maldives we love you but it’s time to say goodbye! Our last day at the Sun Island Resort and Spa was mostly spent in relaxing and soaking in the beauty of the island. We wanted to capture as much beauty in our memories before leaving and in the end, I think we did do justice to our endeavor. We left the resort at 2 pm for our flight back to India. 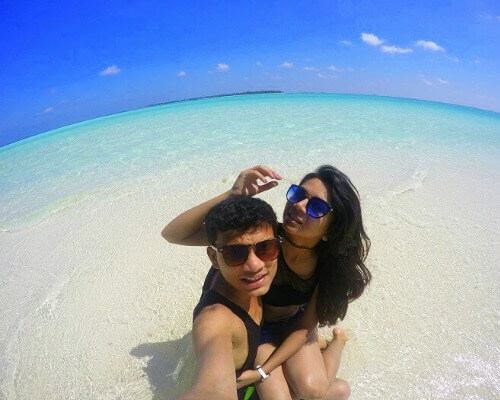 Maldives turned out to be the perfect choice for our honeymoon. It was breathtakingly beautiful and offered us a lifetime of happy memories. 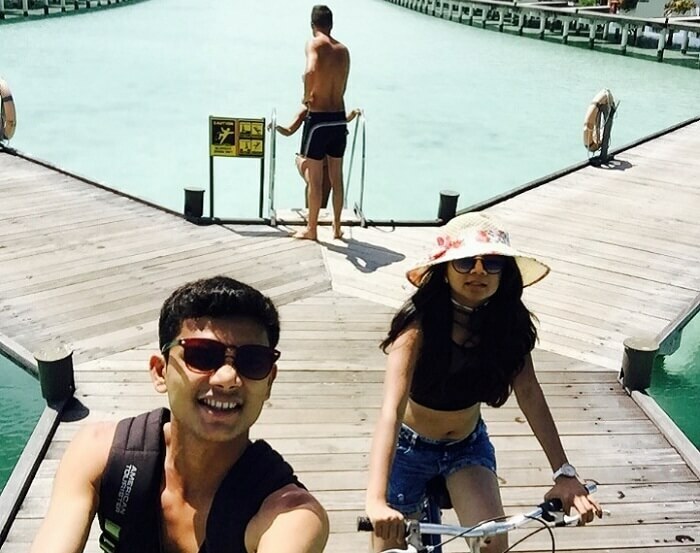 Being there felt so surreal and we could almost feel as if love was in the air – all the time! Truly, a wonderful trip. Facilities and services of the resort were excellent! 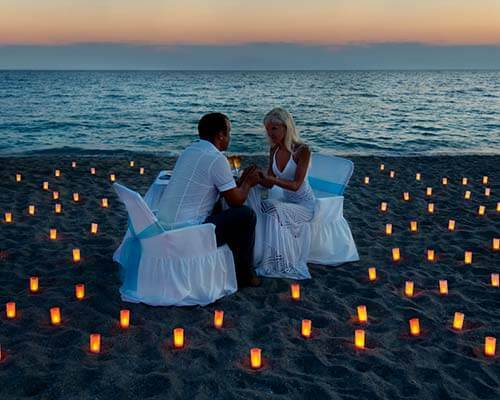 The island offers enough peace and privacy to keep the honeymooners comfortable. Complimentary half liter water bottle was given to each person for 24 hrs and the subsequent 1.5 ltr bottles cost us 5$ each. 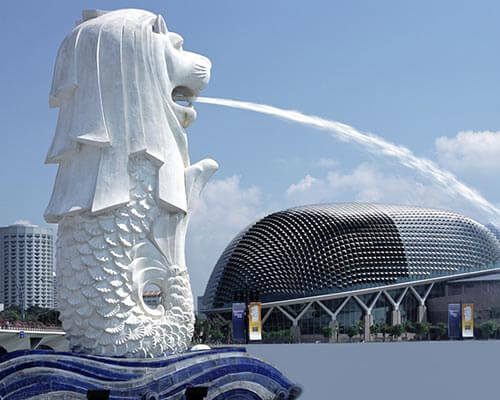 This trip was value for money and offered excellent services and experiences. We would definitely recommend it to all honeymooners! When I started comparing online tour packages on all the traveling websites. 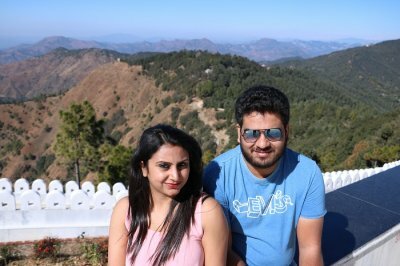 I got quickest and cheapest quotations from TravelTriangle and I booked it in few days. 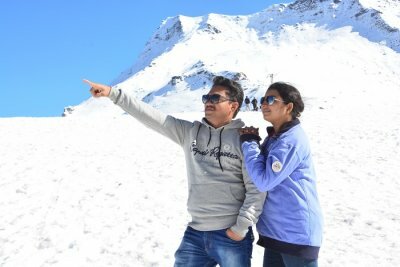 My travel agent – Travelmate India (Sunanda ma’am) response was fabulous and was also in touch with us during the trip. 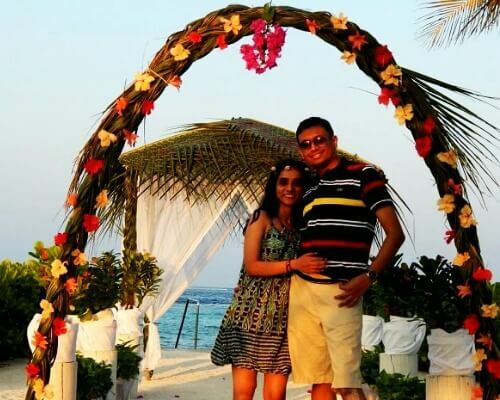 Maldives is a perfect destination for all couples who want to experience the best of luxury and nature. 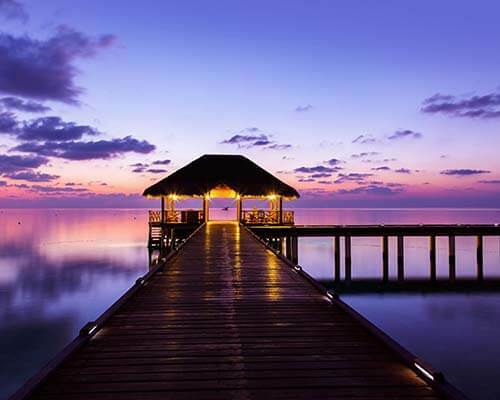 Pristine and breathtakingly beautiful, one can easily customize their Mauritius Honeymoon Package as per their needs and experience a trip of a lifetime. Book Now.